Hepatic iron overload can be due to abnormalities in iron metabolism or secondary to excessive blood transfusion. This can lead to the development of chronic liver disease and most patients can be asymptomatic early in the disease course. The current gold standard for the assessment of hepatic iron content is magnetic resonance imaging (MRI), which has replaced dry weight iron estimation from liver biopsy. 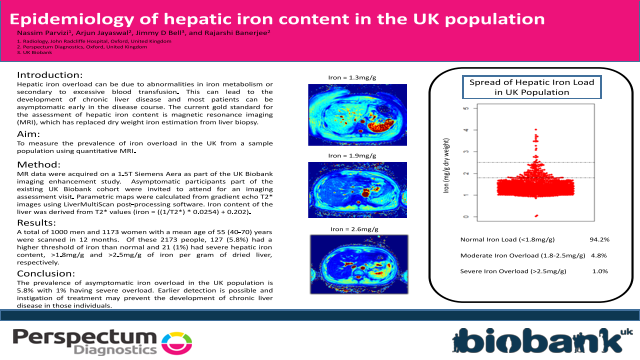 To measure the prevalence of iron overload in the UK from a sample population using quantitative MRI. MR data were acquired on a 1.5T Siemens Aera as part of the UK Biobank imaging enhancement study. Asymptomatic participants part of the existing UK Biobank cohort were invited to attend for an imaging assessment visit. Parametric maps were calculated from gradient echo T2* images using LiverMultiScan post-processing software. Iron content of the liver was derived from T2* values (iron = ((1/T2*) * 0.0254) + 0.202). A total of 1000 men and 1173 women with a mean age of 55 (40-70) years were scanned in 12 months. Of these 2173 people, 127 (5.8%) had a higher threshold of iron than normal and 21 (1%) had severe hepatic iron content, >1.8mg/g and >2.5mg/g of iron per gram of dried liver, respectively. The prevalence of asymptomatic iron overload in the UK population is 5.8% with 1% having severe overload. Earlier detection is possible and instigation of treatment may prevent the development of chronic liver disease in those individuals.